How Apple Watch could predict heart attacks in the future. The Apple Watch heart rate monitor is far better than everyone thought, and that could theoretically lead to big medical breakthroughs — like the ability to predict heart attacks before they happen. Developer Brad Larson dug into raw Apple Watch HealthKit heart rate data after a run and compared it to data from a heart rate monitor he had been wearing. The Apple Watch doesn’t have Food and Drug Administration approval as a medical device, but Larson discovered the wearable is nearly as accurate as an electrocardiogram. Larson comparde Apple Watch to a Mio Alpha heart rate monitor, which is noteworthy for its tested EKG accuracy at performance speeds. 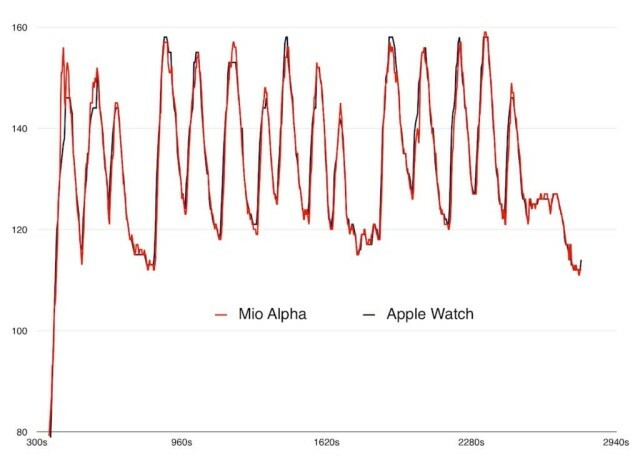 The Mio Alpha takes samples every three seconds while Apple Watch grabs one every five, but the readings were nearly identical. Having an EKG-accurate monitor strapped to wearers throughout the day could be hugely beneficial to the study of heart disease. Patients currently have to go a doctor’s office or hospital to get an accurate EKG reading while running on a treadmill. Accurate EKG data generated throughout a normal day, combined with other metrics, could help researchers understand more about heart performance. Apple would need to get FDA approval just to show EKG data or to give medical guidance, but medical tech expert Euan Thomson told KQED that if Apple Watch gets the government’s thumbs up to monitor your EKG, software could be used to warn users of a heart attack or stroke days in advance. Thomson would know, too: His company AlivCor was the first to get FDA approval for a mobile EKG monitor. They’ve also got an FDA-approved algorithm that can detect atrial fibrillation (an irregular, often rapid, heart rate that can cause poor blood flow) from their iOS app. Getting that FDA approval would be the hardest part of the process, but Apple has already shown a dedication to making a true impact in medical research with HealthKit and ResearchKit. They secretly included a blood oxygen meter in the Apple Watch that hasn’t been turned on yet, and they’ve hired a team of medical experts. It looks like something a lot more important than counting steps is on the way. ‘Redacted’ Hits Number 8 Spot in Mac App Store With Just $302 in First-Day Profit. Never lose the remote again with DirecTV’s Apple Watch app.